Two months after a deadly jihadist attack on a major hotel, Mali's capital Bamako has sought to reboot the country's once-famed cultural scene with a festival featuring some of the biggest names in African and world music. 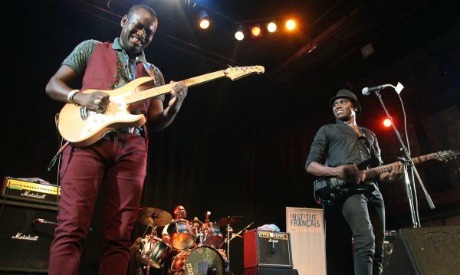 The Festival Acoustik, organised by top Malian musician Toumani Diabate, welcomed international names such as Blur frontman Damon Albarn and African stars including Nigerian drummer Tony Allen. Mali is under a nationwide state of emergency declared after 20 people were killed in an attack claimed by two jihadist groups on the Radisson Blu hotel in Bamako on 20 November 2015. "It's very important for me, for us, to get Malian culture going," said Diabate, delighted that guests defied the Islamist threat to show up for the four-day festival, which wrapped up on 30 January. "You see Mali is the heart of culture in Africa." The country's reputation as a cultural destination has suffered with the rise of Islamist violence in recent years. Northern Mali fell under the control of jihadist groups linked to Al-Qaeda in 2012. Among the visitors to the festival was US actor Gary Dourdan, best known for his role in the CSI (Crime Scene Investigation) cop dramas. Malian acts at the festival included Songhoy Blues, a group from the country's troubled north helped to prominence by Albarn -- a regular visitor to Mali, who collaborated with Diabate and other local artists on a 2002 album. "In 2012 when the jihadists invaded the north of Mali, it forced my friends to flee to the south. So they came here and we had the idea of creating the group," said singer Allou Toure. "For us it was a way of resisting. Playing in Bamako, where we find ourselves, it gives us comfort. Our dream is to return home one day, to bring life back to the suffering people." While waiting for peace to return to their home area, the group -- who have had some success with their album "Music in Exile" -- are preparing for a tour of Australia. Drama student Alima Togola said she was delighted to have the chance to party in Bamako once again, thanking Diabate for bringing the stars to the city.